The newest addition to our VU space isn’t a game or a book or a tangible object, but it is powerful. 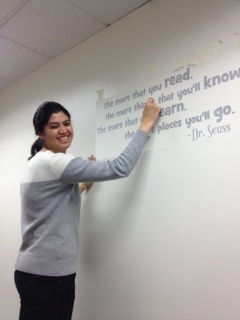 Recently, boardmembers added a Dr. Seuss quote that we hope students will memorize, take to heart, and carry with them beyond VU. It’s what we work toward every day with every student. And the kids really do love Dr. Seuss, so they are hearing it from a fun friend! the more things that you’ll know. A message to take to heart.